Simplicity Circuit Breaker: Jacks is your Place! We have the Circuit Breaker you need, with fast shipping and great prices! For lawn mower parts and accessories, think Jacks! SIMPLICITY : 1691380 Sunstar, 1692870 Legacy, 1693973 Prestige, 1692055 512G, 1692056 512H, 1691042 616 Special, 1691146 611 Special, 1691177 613 Special, 1691466 Vanguard, 1692900 Zt, 2690642 Axion, 1690334 7010, 1690341 7016, 1690342 7016H, 1690352 7012H, 1694536 2413, 1694613 2413H, 1691711 1920H, And Many More. 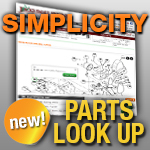 SIMPLICITY : 5900660 Zt3000 Series W 44In Mower, 1694744 Champion Zt, 2690088 Consumer Zero-Turn, 5900928 Massey Ferguson 355X, And Many More.